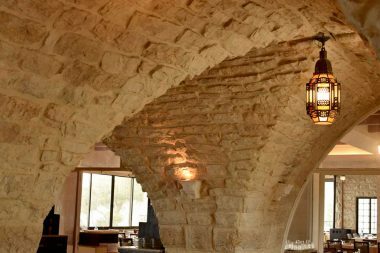 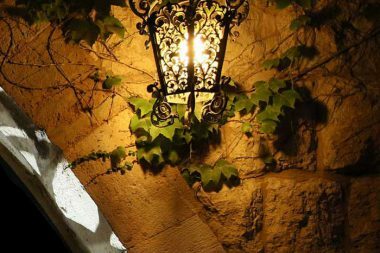 Perched high on a cliff that overlooks the beautiful city of Beirut and its Mediterranean coast lays Al Sakhra, a family-owned restaurant. 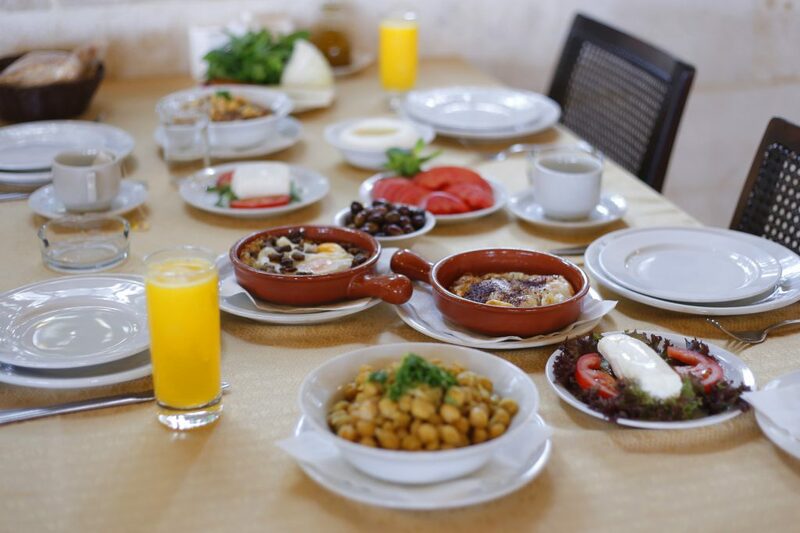 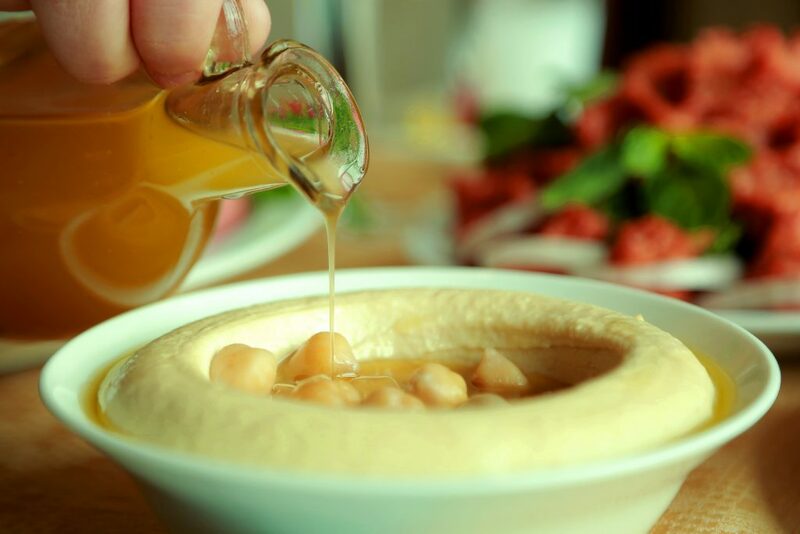 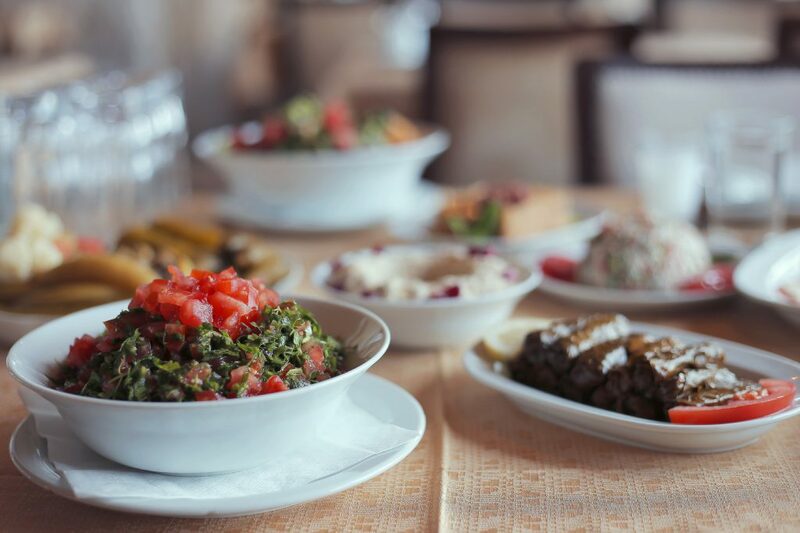 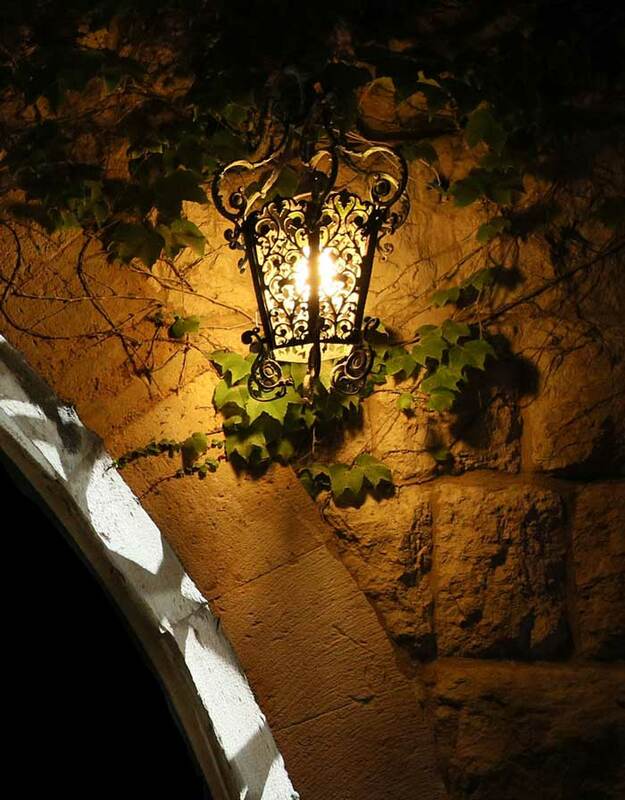 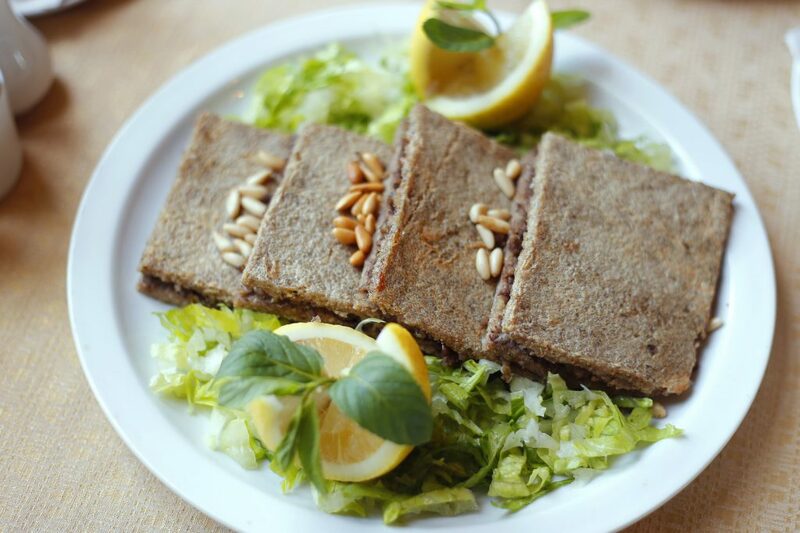 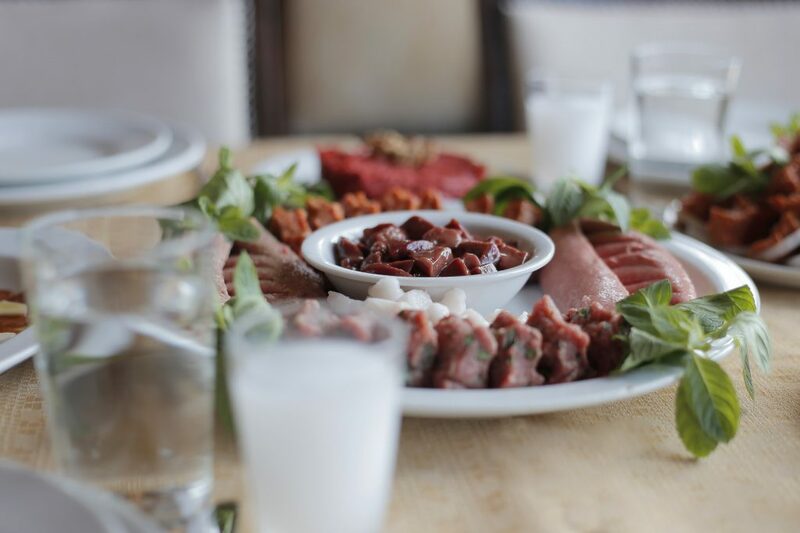 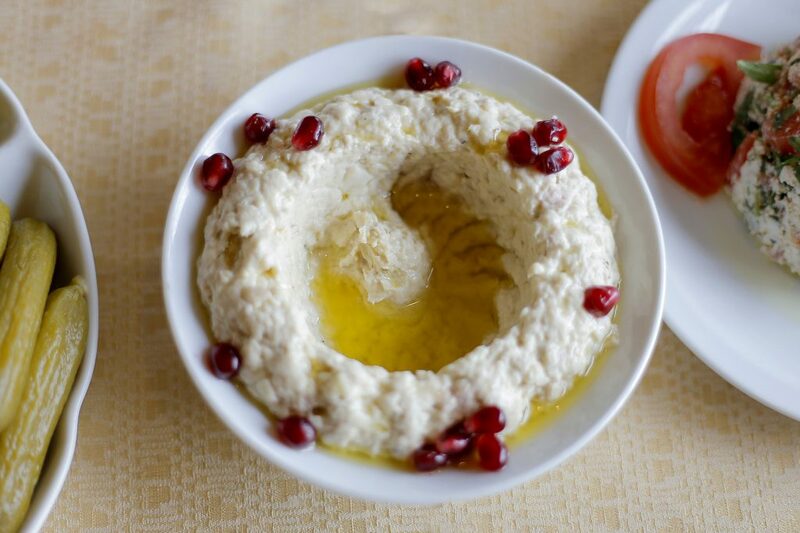 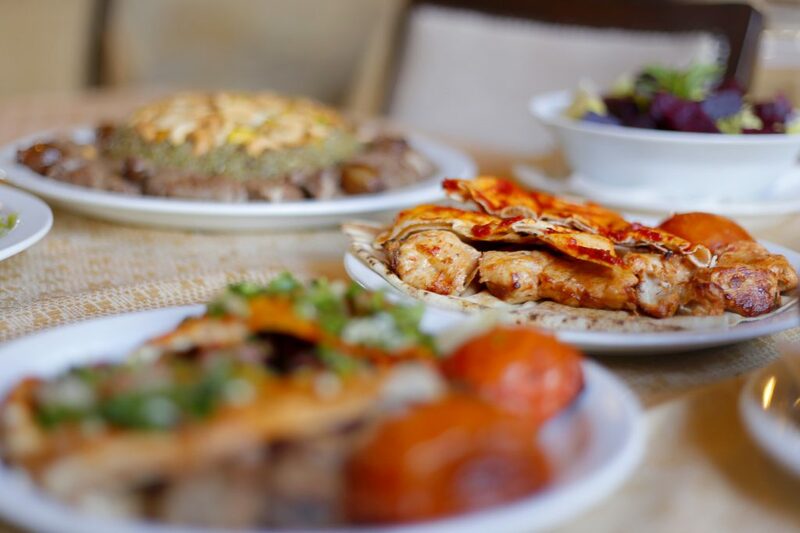 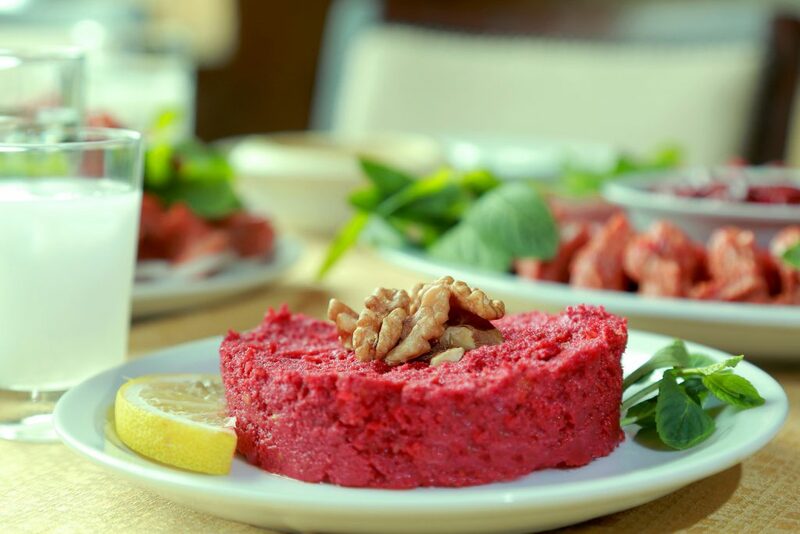 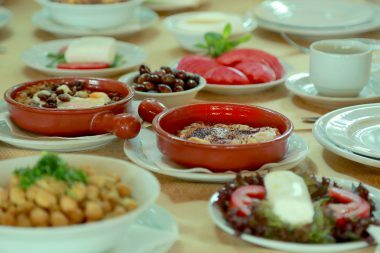 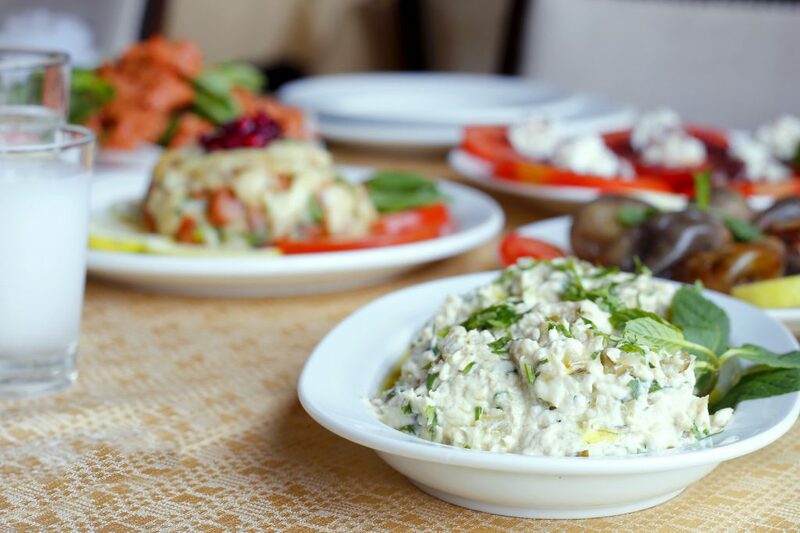 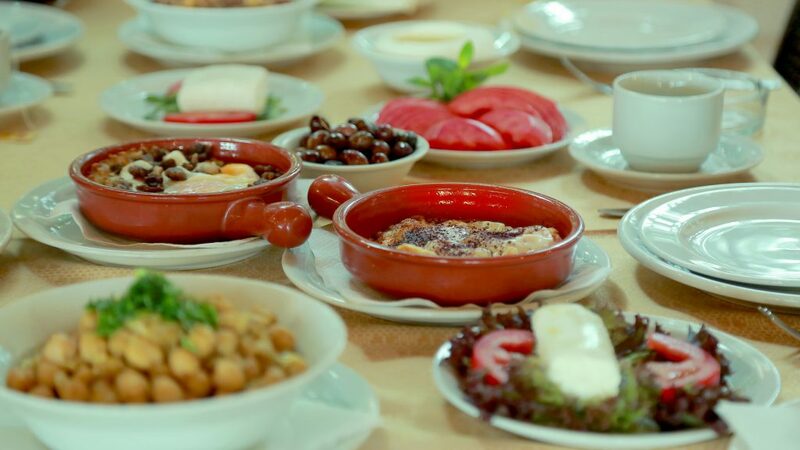 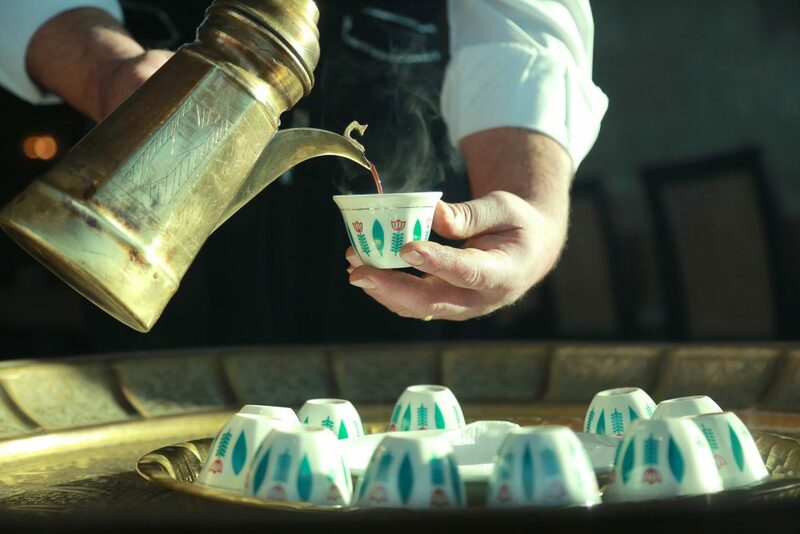 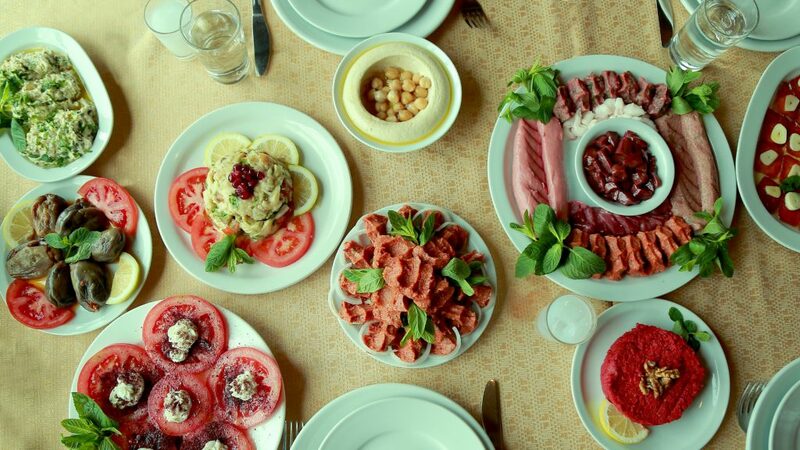 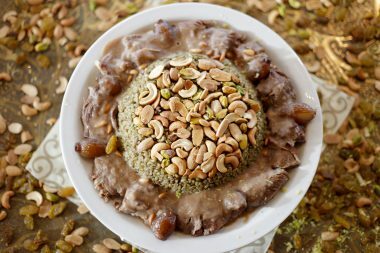 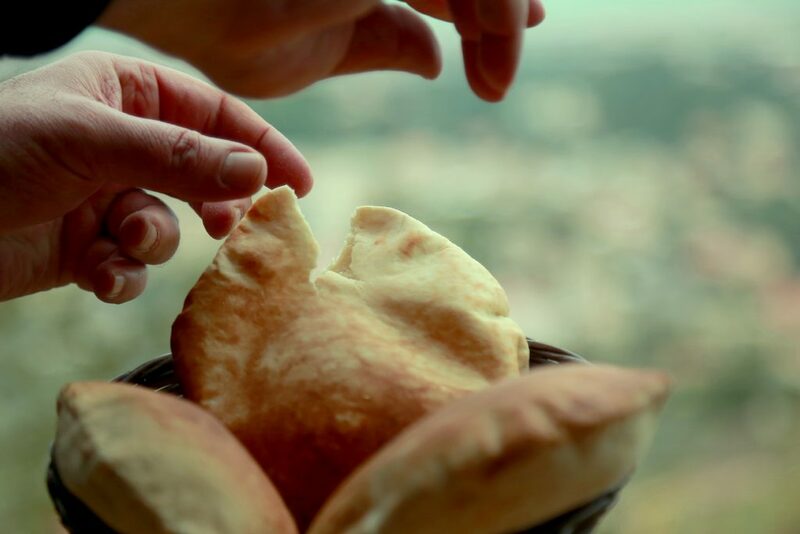 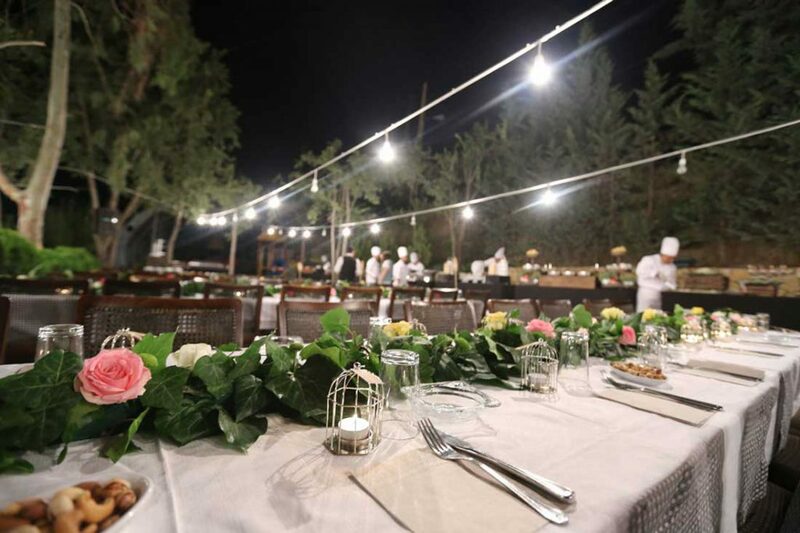 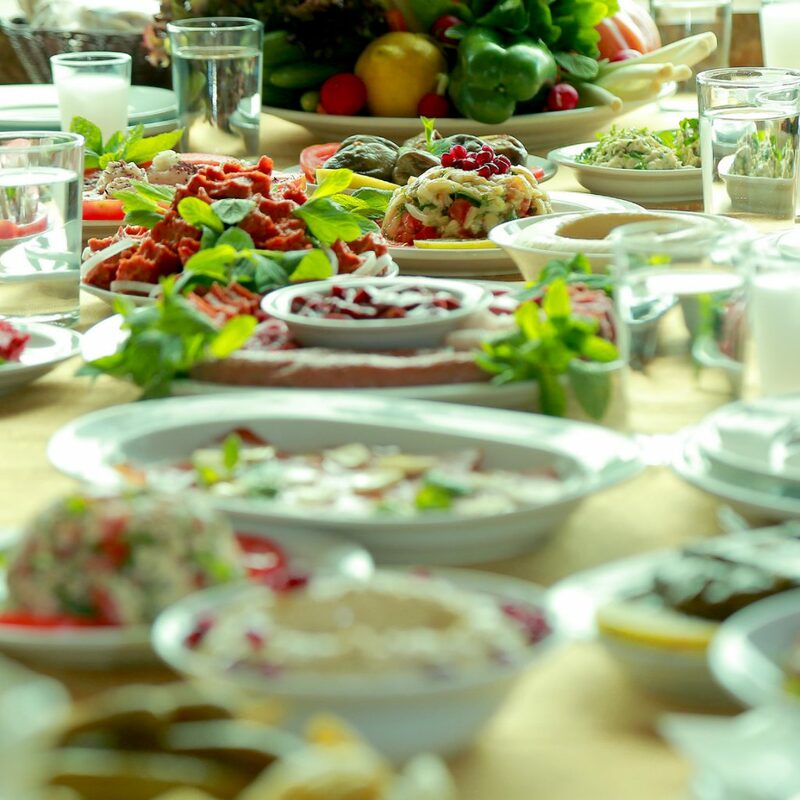 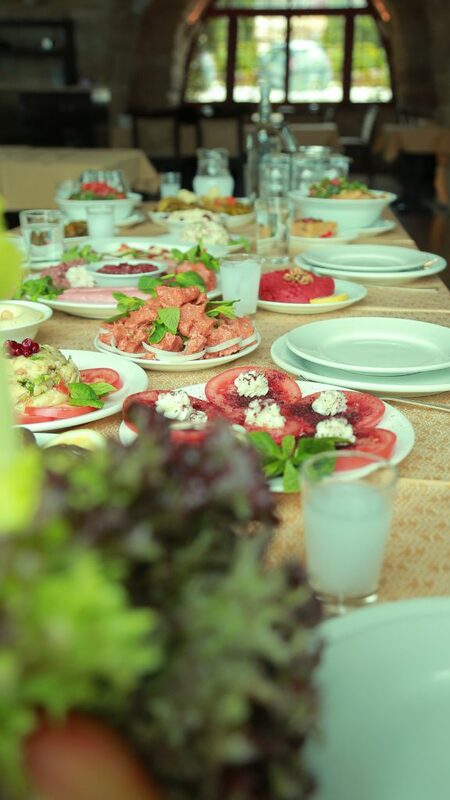 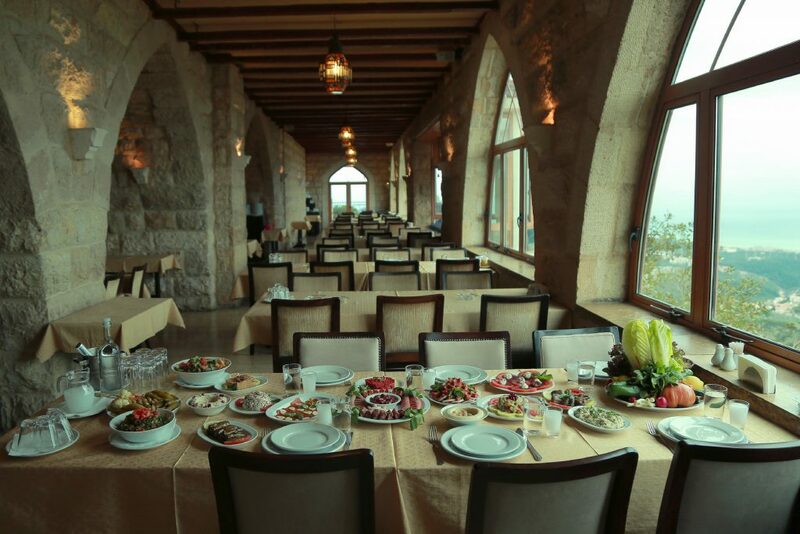 Al Sakhra is a true testament to Lebanese culinary heritage and spirit, serving Lebanese food for 80 years.Founded in 1936, Al Sakhra is more than local cuisine with a breathtaking view. 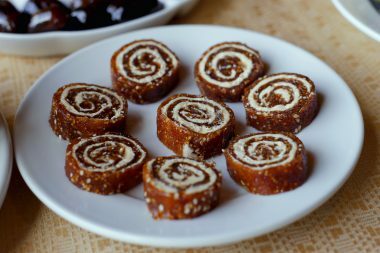 Walking through the beautiful arched stone, the smell of Mezze, Mashawi and freshly baked bread whiffs through the air with Fayrouz softly playing in the background. 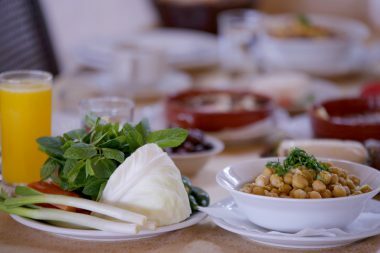 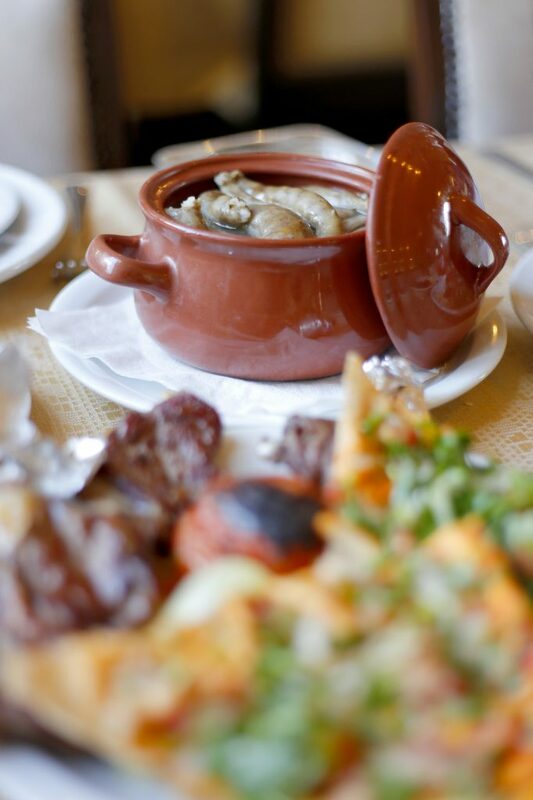 Its charm almost fools you into thinking you’ve stepped back in time, emitting a sense of nostalgia for regulars and newcomers alike who escape into the mountains for a culinary retreat. 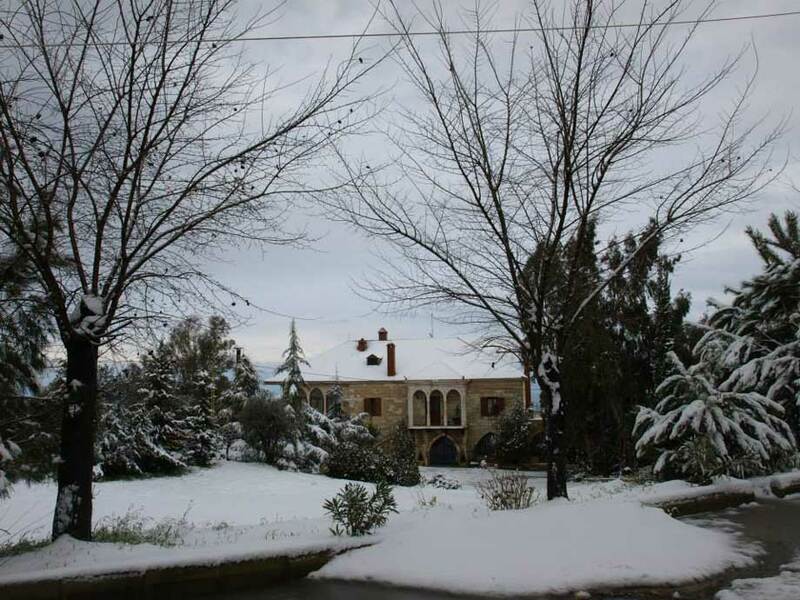 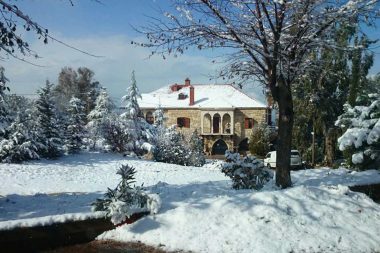 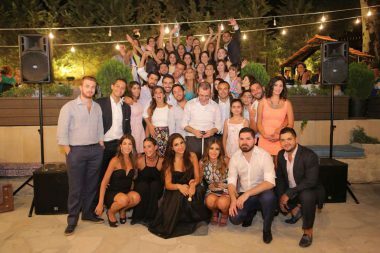 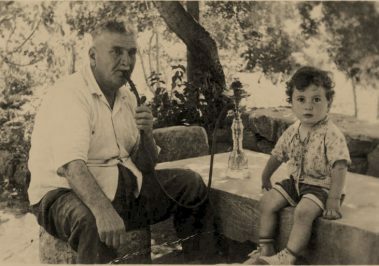 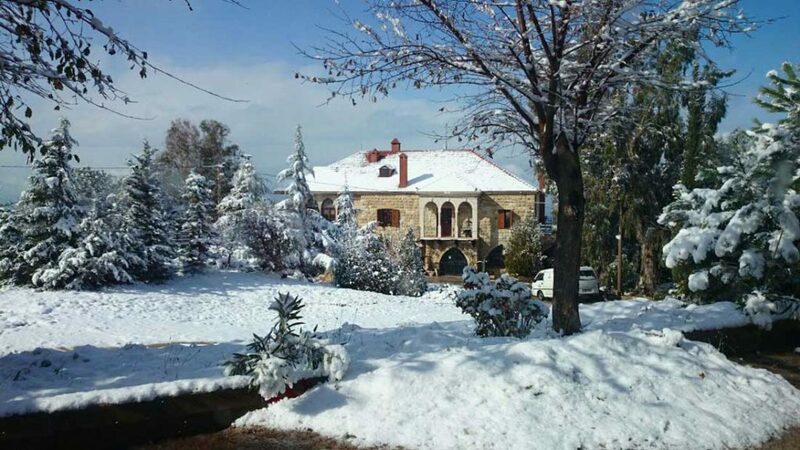 On his long journey from the Bekaa Valley to Beit el Deen, Prince Haidar Al Shihab stopped in the village of Chimlane to recharge. 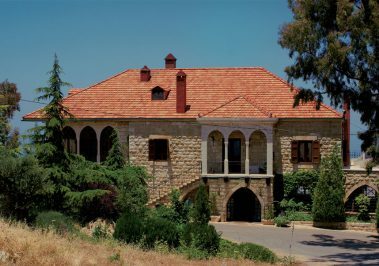 He went on to build stables for his horses, which would unknowingly become the original structure that houses Al Sakhra today. 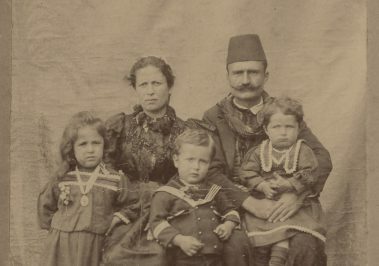 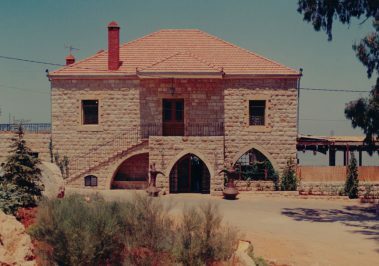 The Hitti family becomes one of the first families to move to Chimlane. 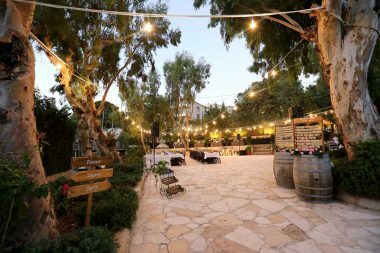 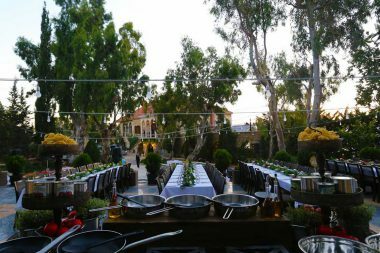 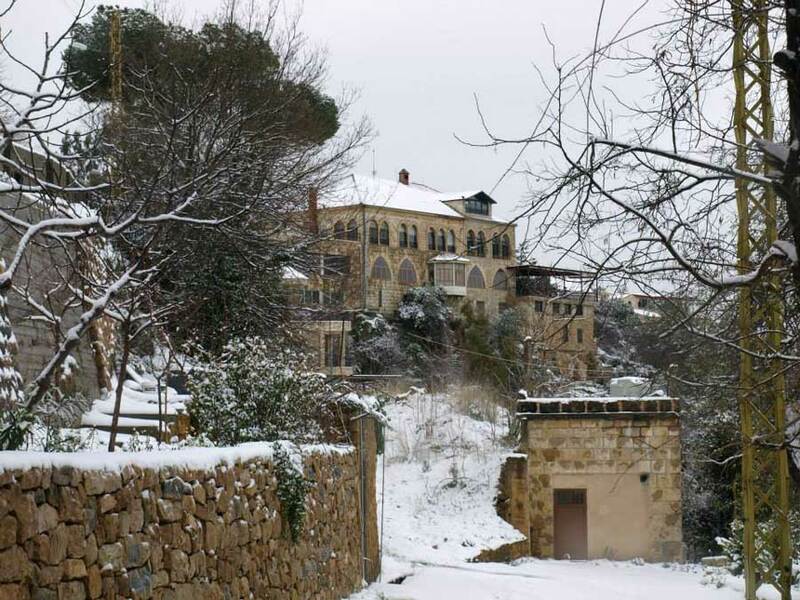 The family rents the space and transforms the abandoned stables into a culinary wonder serving locals, residents of nearby villages, intellectuals, artists and tourists. 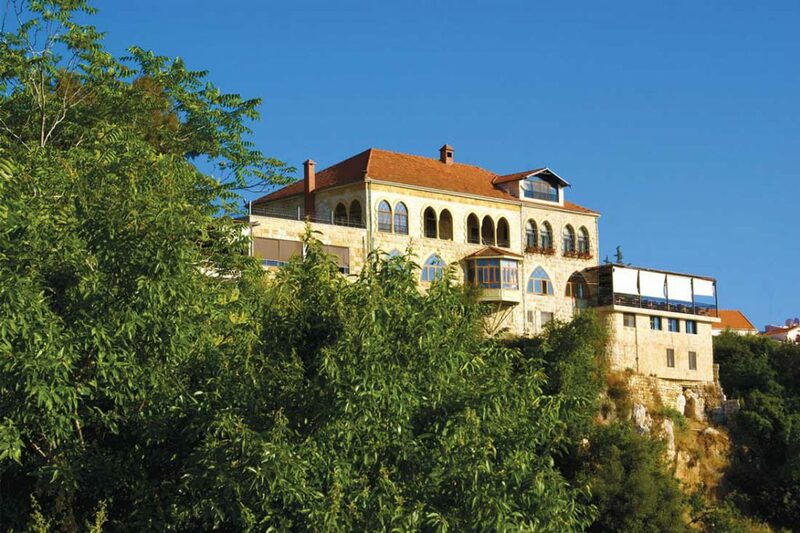 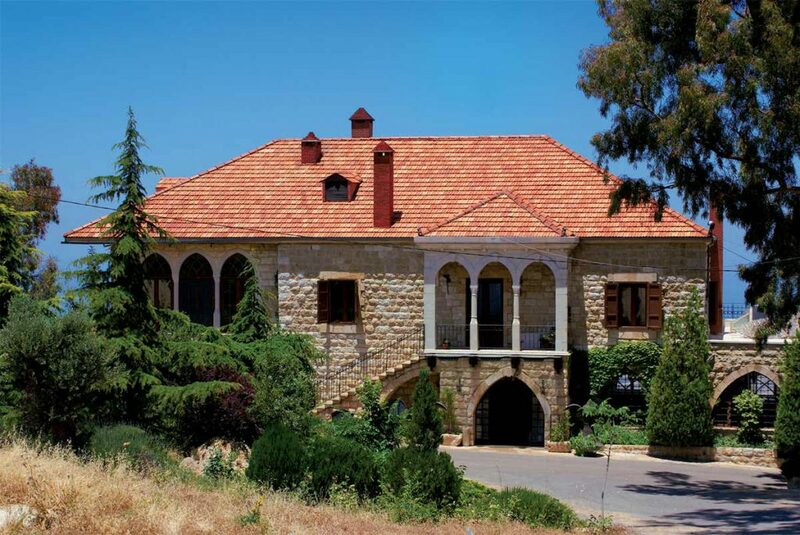 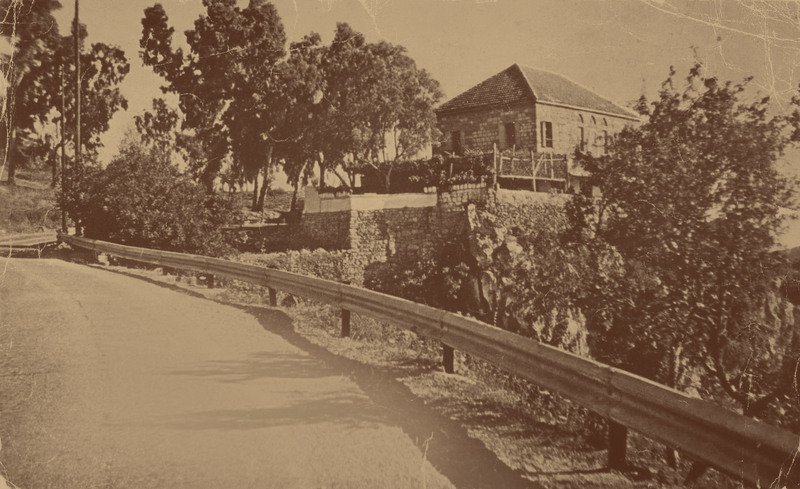 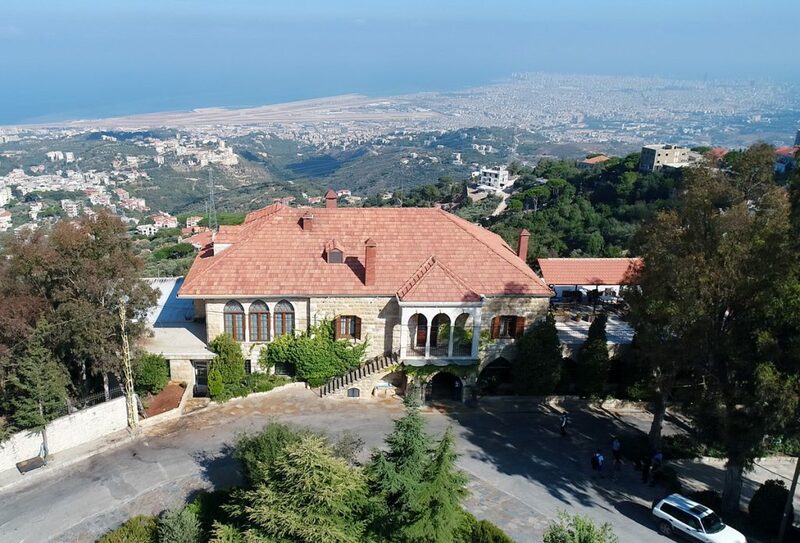 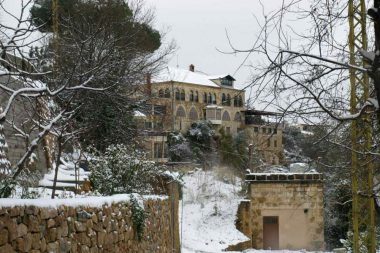 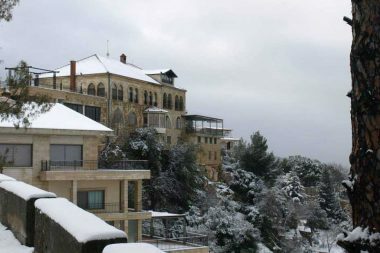 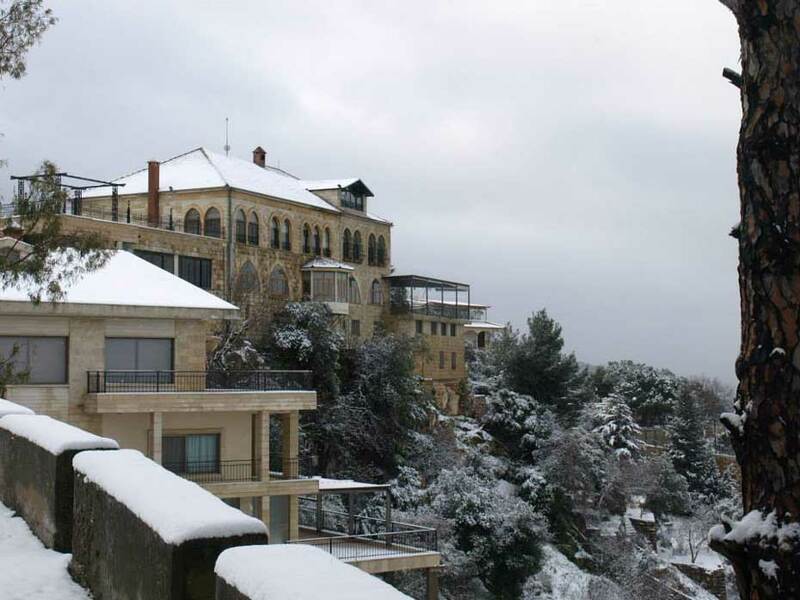 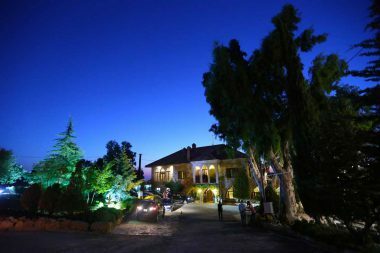 In fact, the name “Al Sakhra meaning Cliff House” itself was suggested by Amin Al Rihani, the famous Lebanese author during one of his many visits. 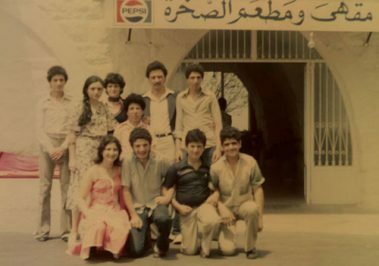 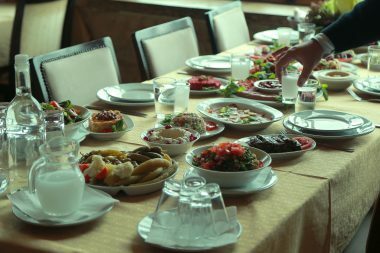 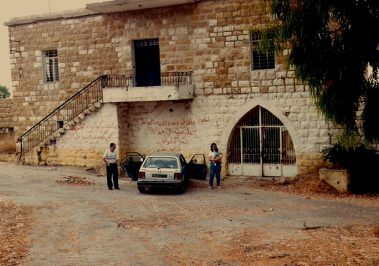 War broke out across Lebanon, forcing the restaurant to close its doors as the family, like many others had to relocate temporarily. 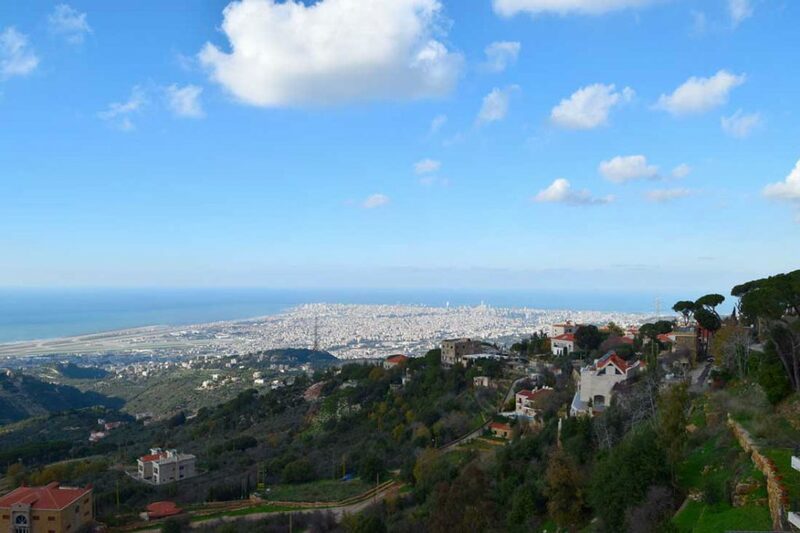 The situation stabilized and Chimlani residents were able to move back home. 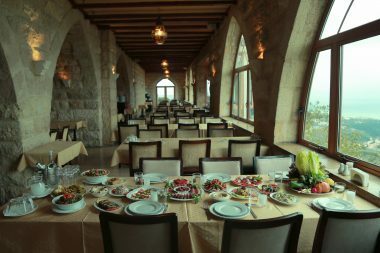 Five years of reconstruction and renovation later, Al Sakhra reopened its doors. 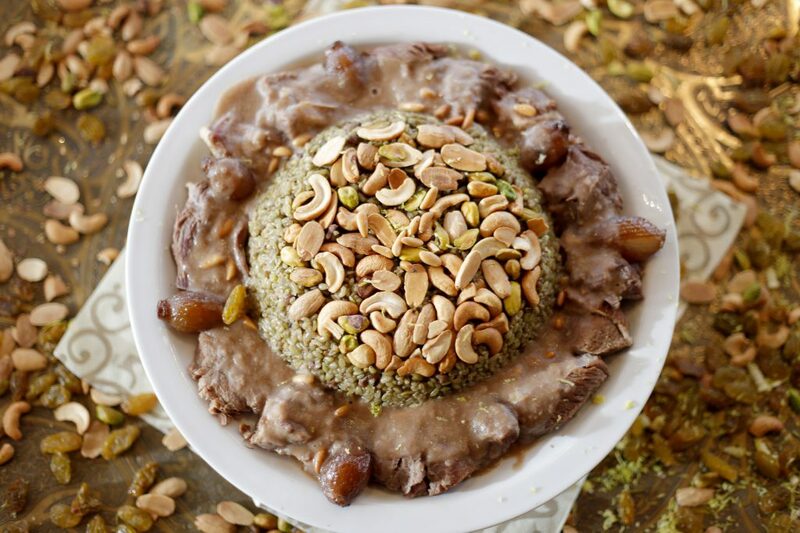 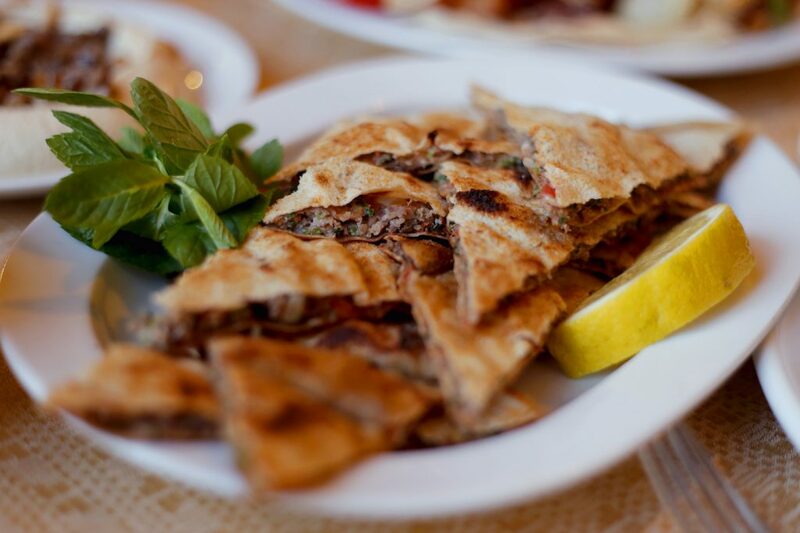 Many loyal customers returned because Al Sakhra stood for a familiar Lebanon; one of joy, happiness, and great food. 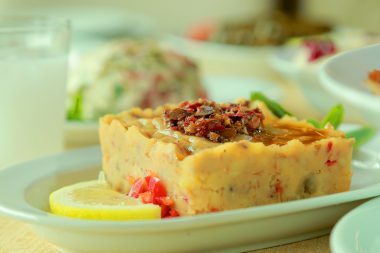 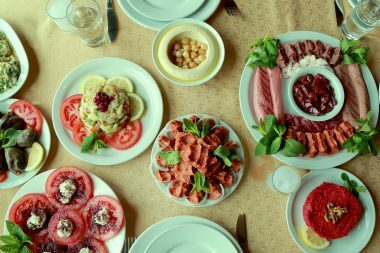 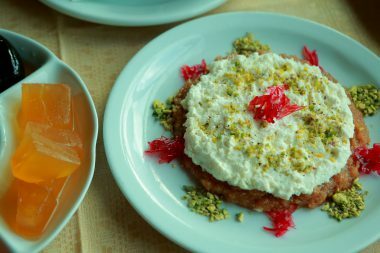 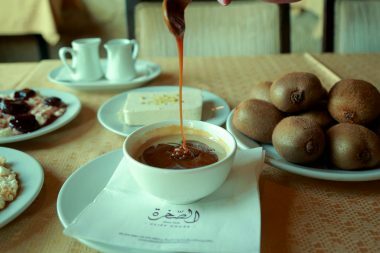 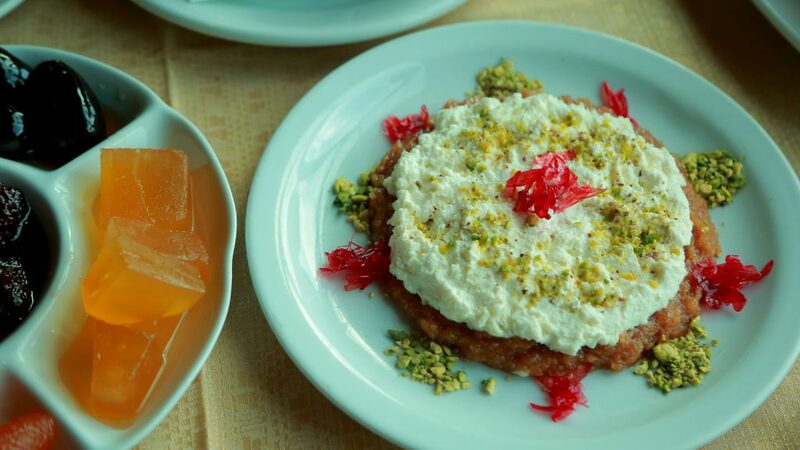 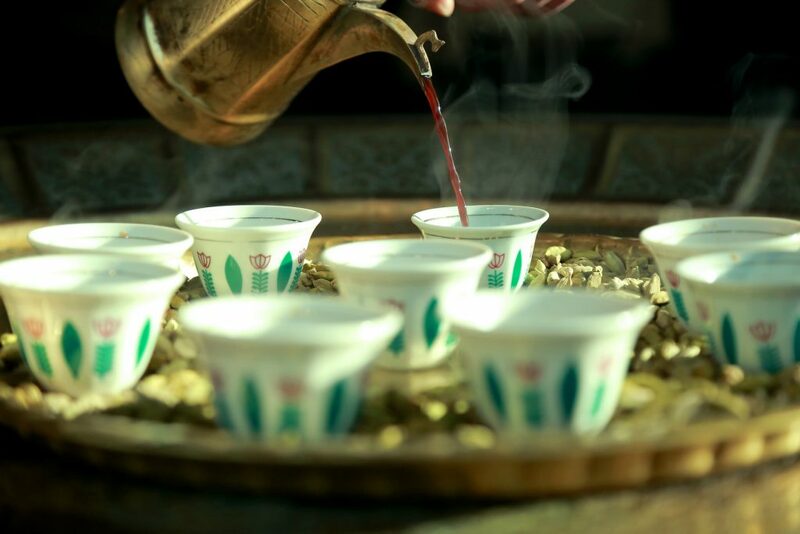 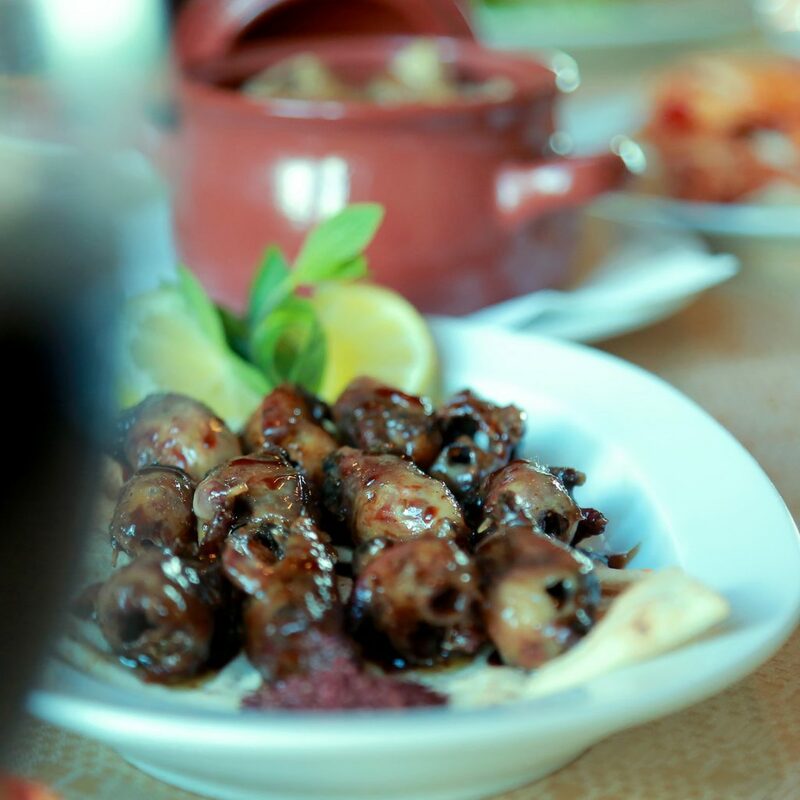 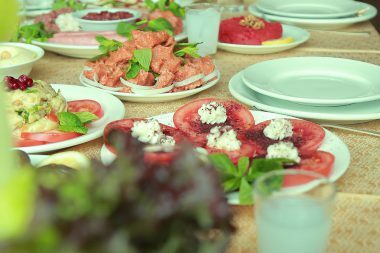 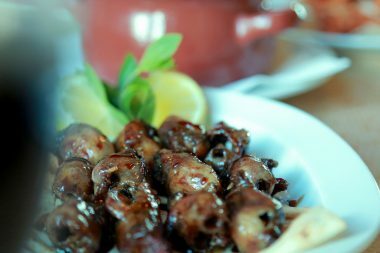 Al Sakhra became an increasingly popular destination as time passed and more & more people discovered the family restaurant passed down from generation to generation. 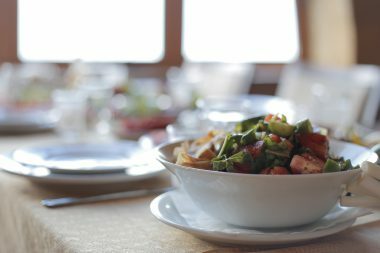 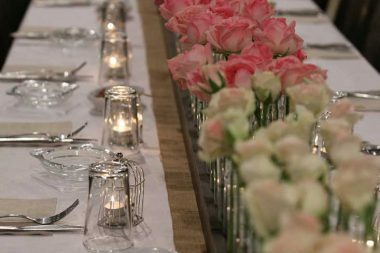 To accommodate, the family expanded the restaurant – today serving 400 happy customers. 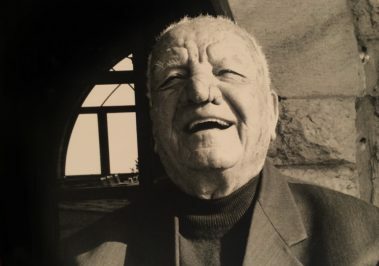 Phillipe Wakim Hitti, the face and heart of the restaurant, passed away at the age of 96. Rain or shine sleet or snow, Philippe did not miss a day at Al Sakhra where he greeted every customer with a warm smile. 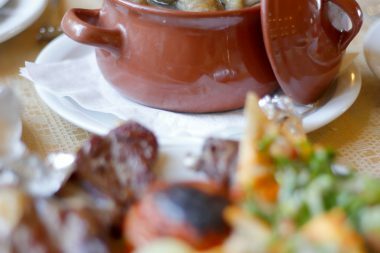 Phillipe lives on by our dedication to his legacy and his kindness. 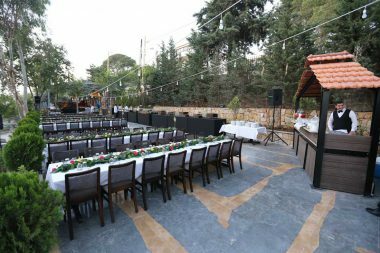 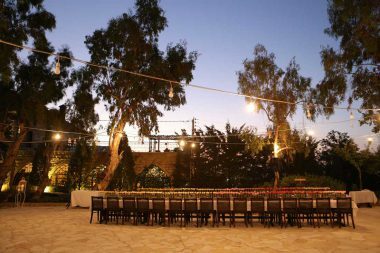 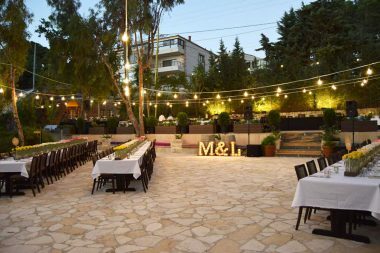 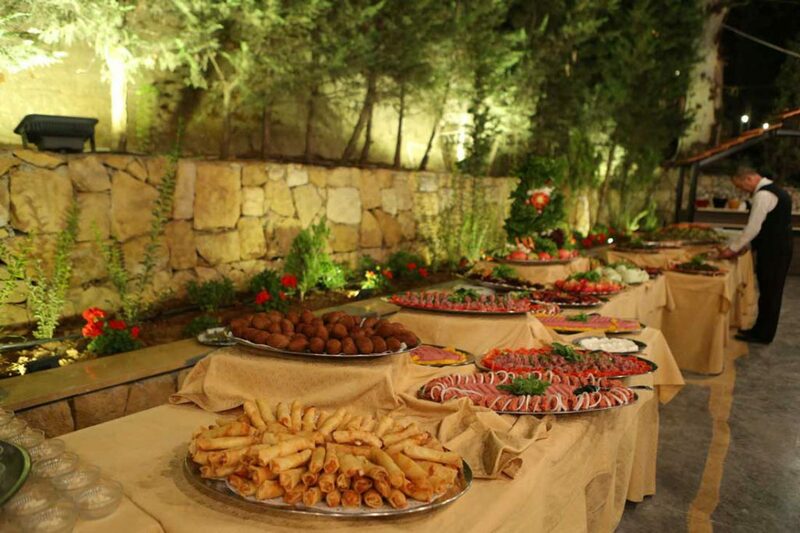 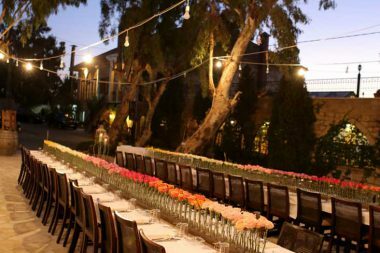 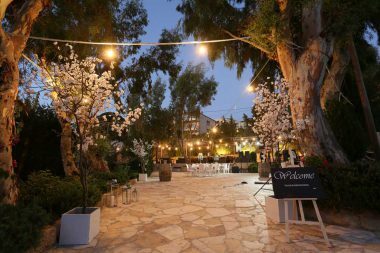 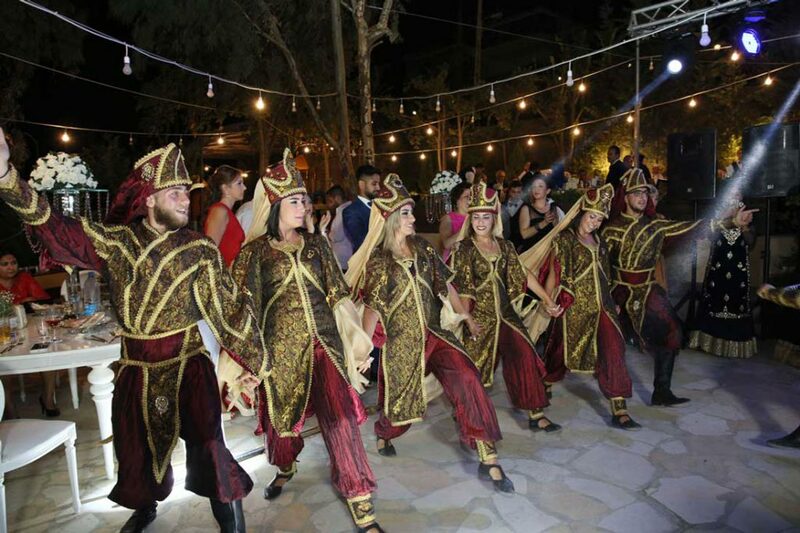 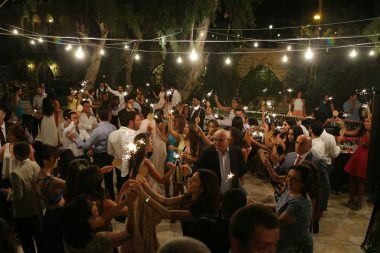 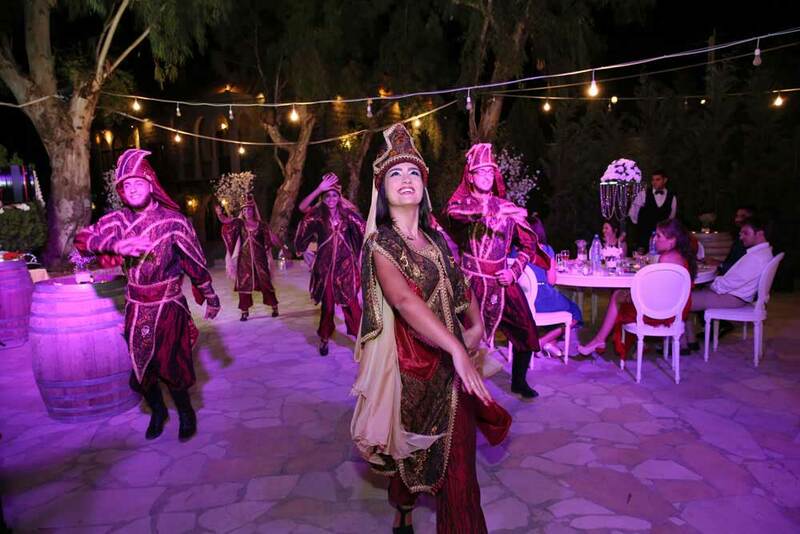 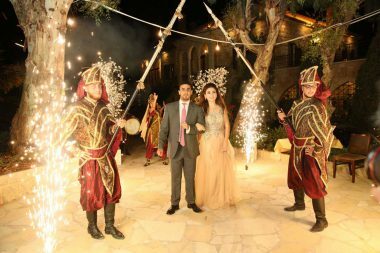 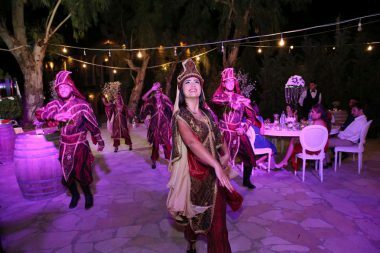 Amongst the lush thicket of Chimlane Al Sakhra went on to open its dedicated outdoor space. 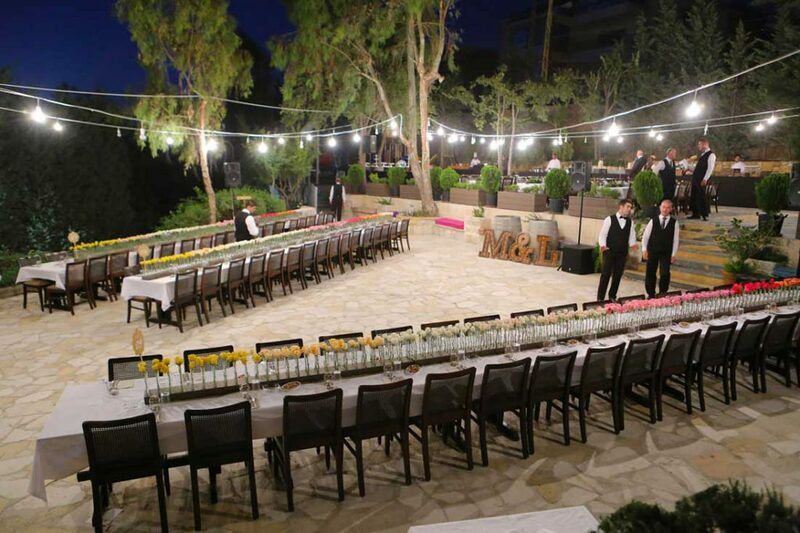 Making your birthday parties, weddings, engagements and events all that more special. 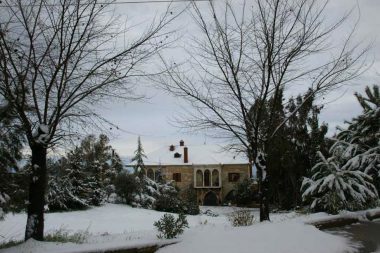 The items listed above are available upon request. 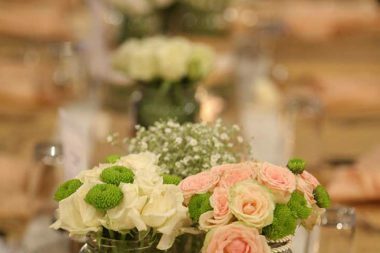 please call 05270369 one to two days ahead. 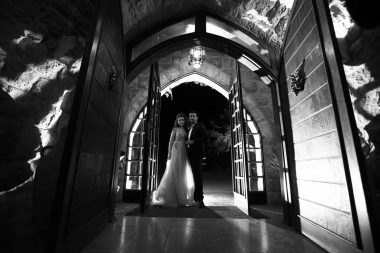 The space itself holds the soul of a genuine Lebanese family, strengthened by walls and stones of traditional Lebanese architecture, sheltered under a crimson brick roof. 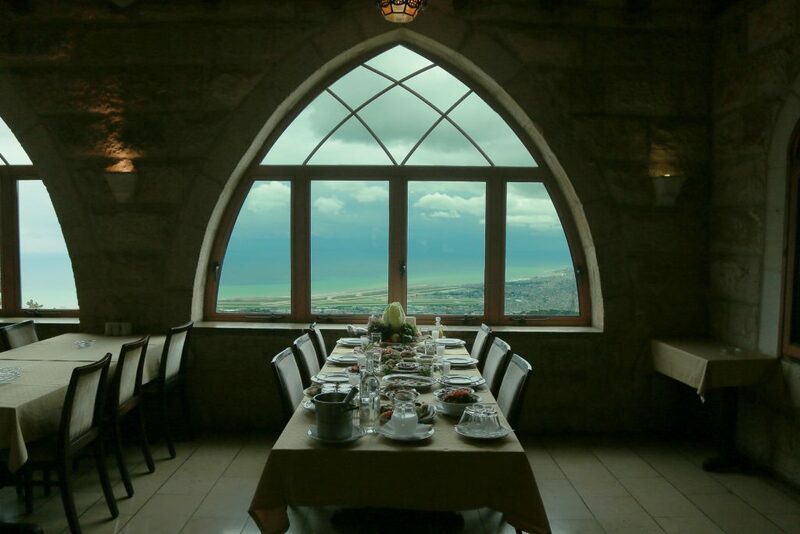 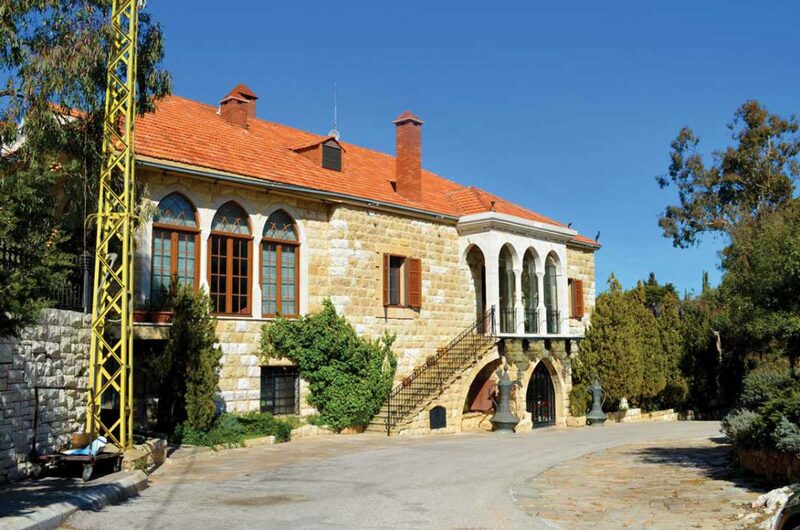 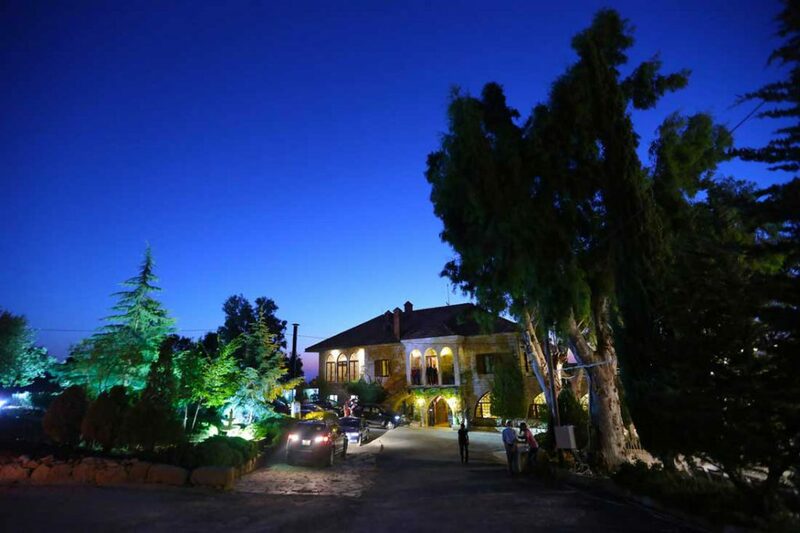 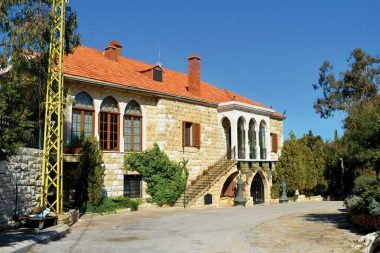 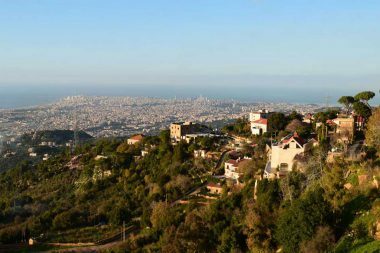 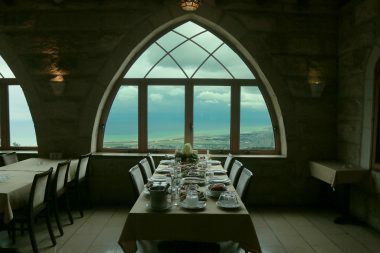 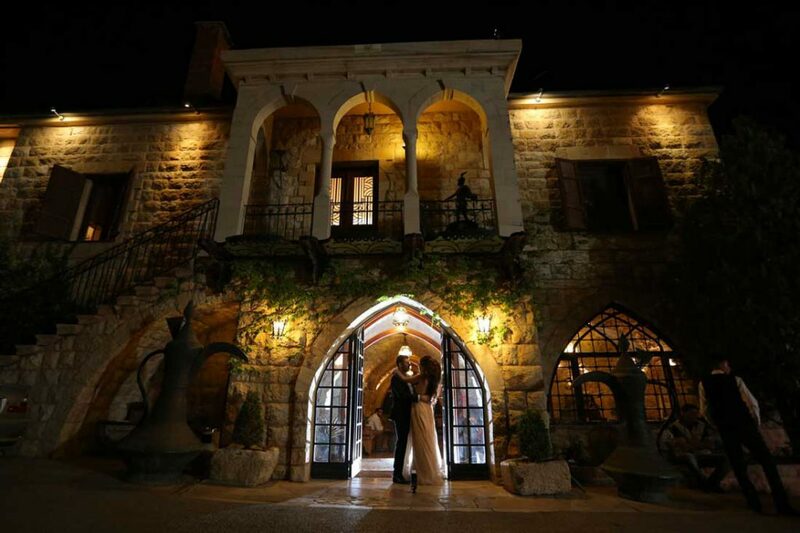 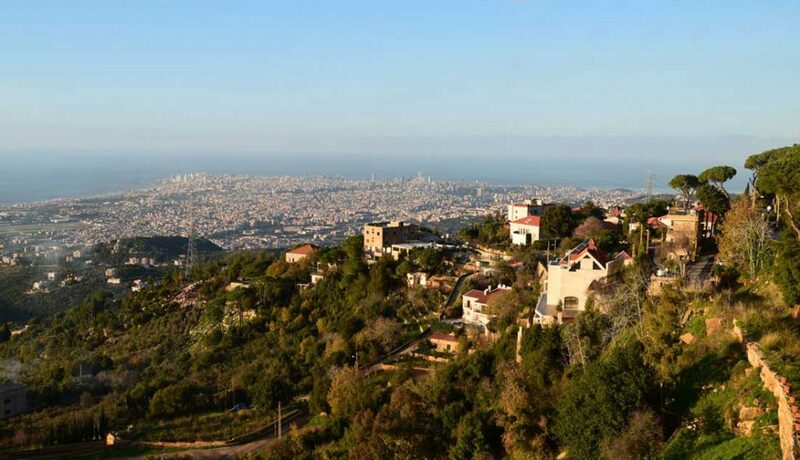 Its location makes for a spectacular view, overlooking the coast of Lebanon and its capital Beirut. The outdoor area also includes a playground, which has served as an unbeatable attraction for families over the years. 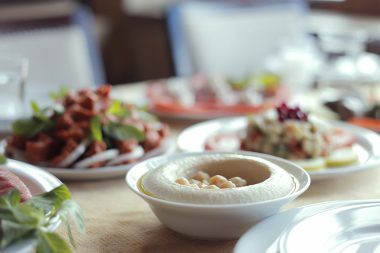 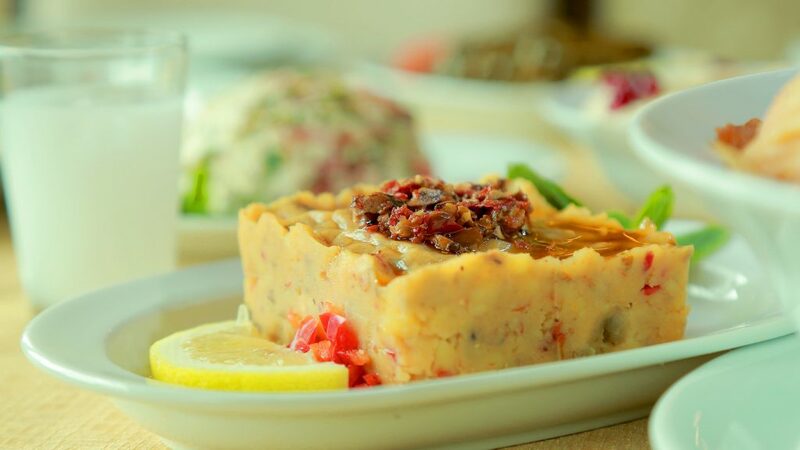 Having opened our doors for decades and for decades more, we strive to maintain the original tastes and flavors of traditional Lebanese. 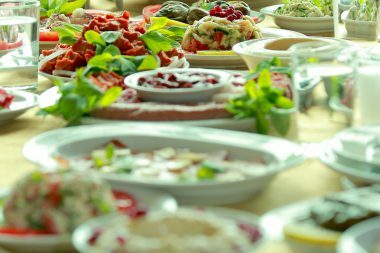 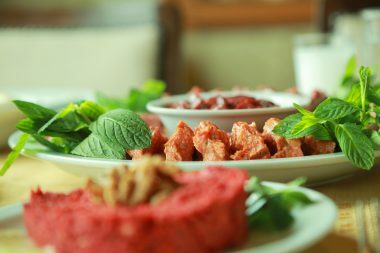 Much of our ingredients is freshly grown & harvested, prepared and cooked to fit the highest culinary standards and the Lebanese spirit. 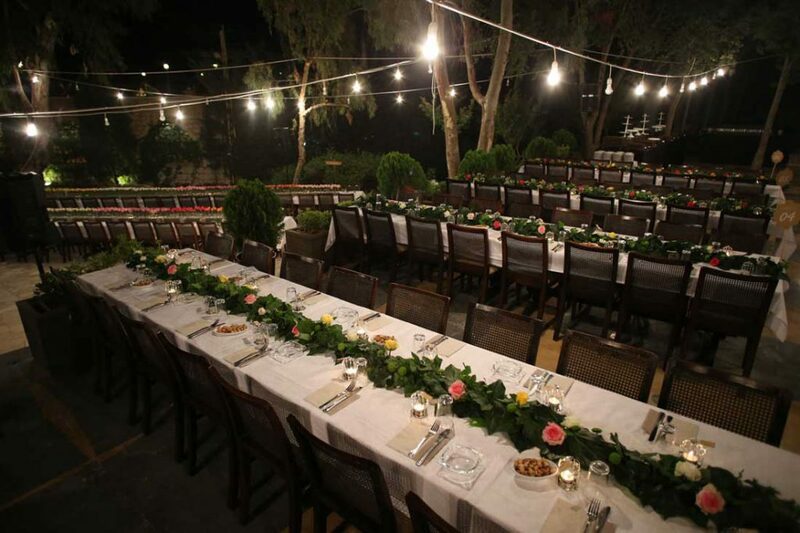 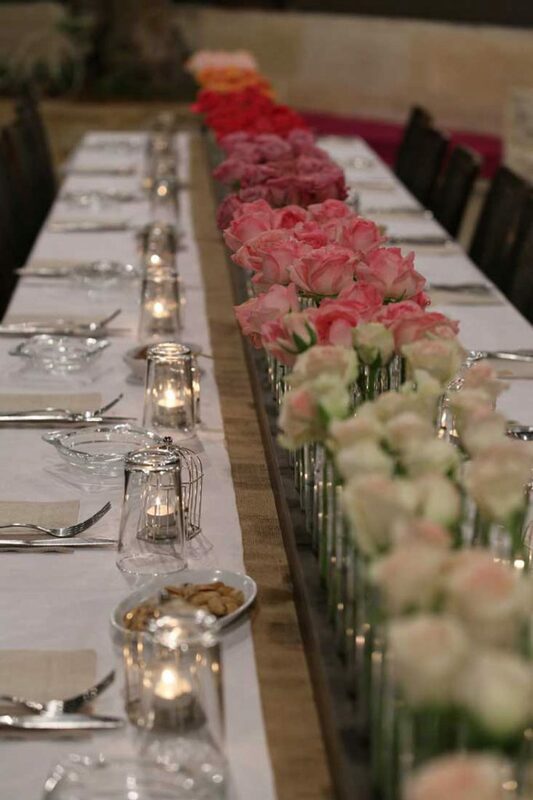 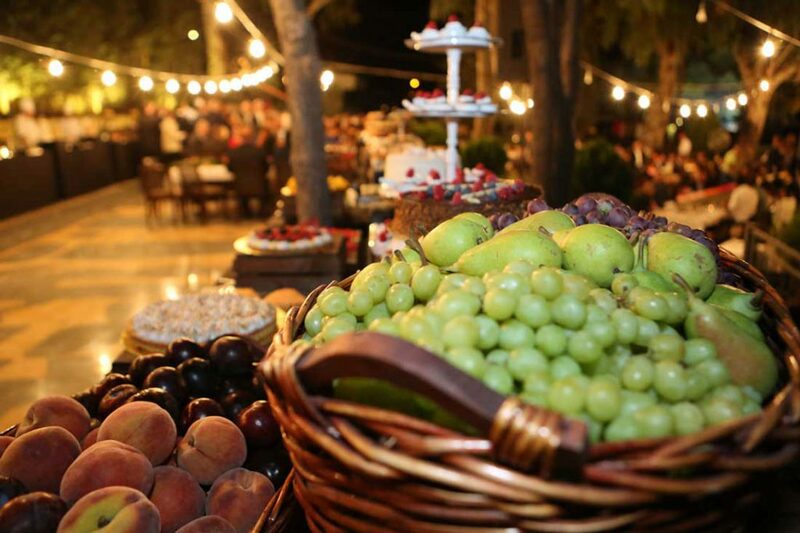 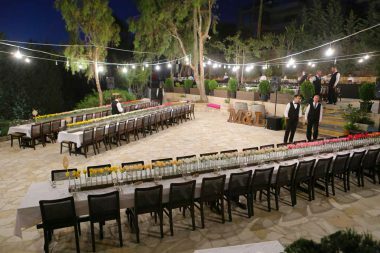 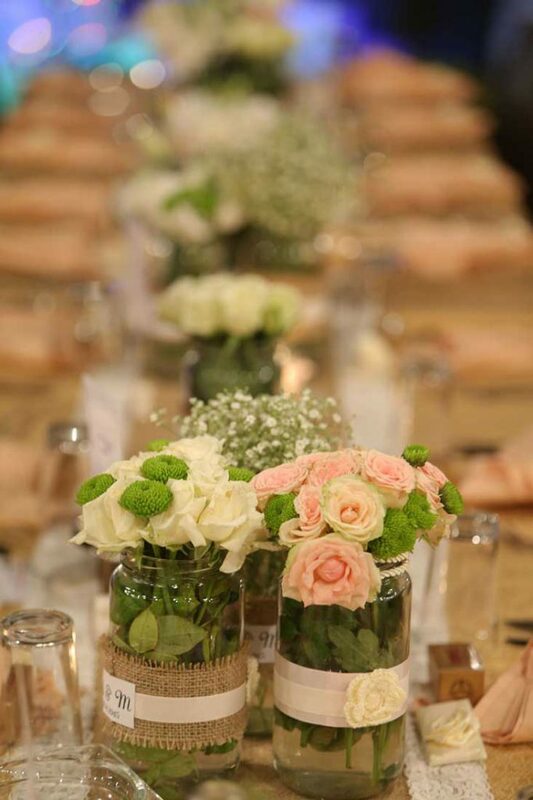 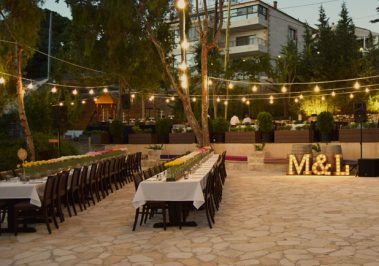 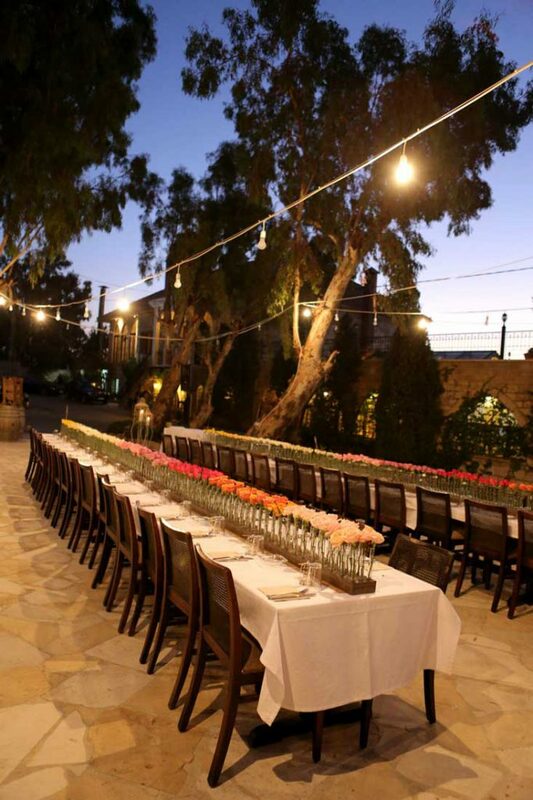 Both our indoor and outdoor spaces are equipped to feature special events. 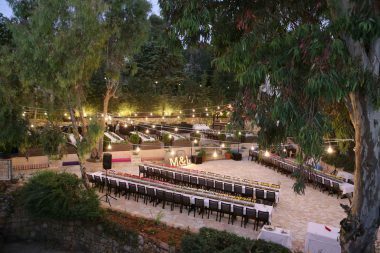 The outdoor space has been recently renovated and equipped to cater to events that hold up to 220 invitees.